her aim is true | Unlikely rock ‘n’ roll photographer Jini Dellaccio visualised punk before it had a name, captured grunge before the hype and embodied indie before it was cool. Art. Music. Photography. An undiscovered American master. In 1964, a middle-aged self-taught photographer, Jini Dellaccio, began hanging out with raucous garage bands like The Sonics in her backyard, creating startling images and innovative album covers. Soon she was grabbing unprecedented portraits of Neil Young and early performances by bands like The Who, Rolling Stones, and Mamas & Papas. 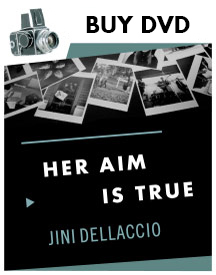 Musicians and rock photographers join Jini Dellaccio on an inspiring tour of her ingenuity and style, with a soundtrack and interviews that capture the Pacific Northwest’s vibrant music subculture. At the heart of this film though, is a legacy lost and found in an enduring story about love, creativity and indie spirit, with universal appeal.